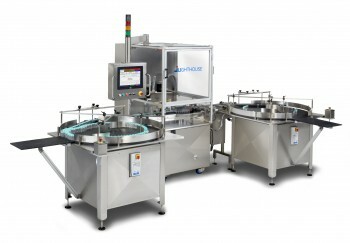 The automated headspace machine platform can be configured for headspace oxygen inspection only. The VISTA/O In-Line Oxygen Inspection System is an ‘in-line, 100% inspection and rejection system’ designed to monitor oxygen levels in sealed parenteral containers. The VISTA/O System is capable of directly measuring oxygen concentrations in the headspace of optically transparent packages stoppered under an inert atmosphere (nitrogen, argon). Up to four oxygen sensors can be mounted on the machine depending on the required line speed and sensitivity. Applications include leak testing of lyophilized and liquid product, and purge performance monitoring during the filling of oxygen-sensitive product, In-process monitoring of headspace oxygen levels in parenteral containers, container closure integrity testing in pre-filled syringes etc. The non-destructive nature of the measurement enables a full statistical documentation of system performance.